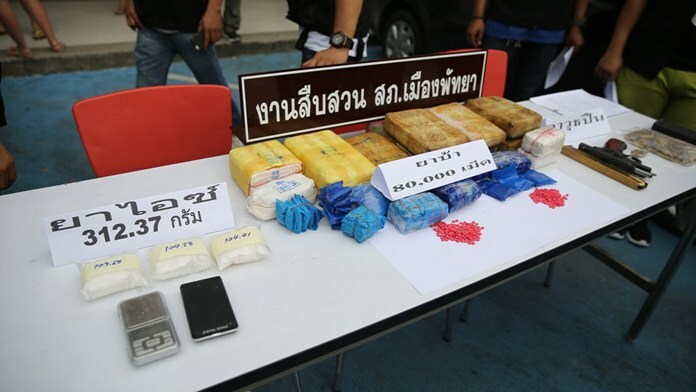 Pattaya police seized 80,000 methamphetamine tablets and another million baht in property from two alleged drug dealers operating out of Pattaya. Nakapol Jaroonkittawee, 38 of Samut Sakhon, and Krung Euimbang, 39 of Bangkok, were brought to a police news conference May 19 following their arrest in the Bang Na section of the capital where they had been followed from Pattaya. Police showed off the 80,000 ya ba pills, plus a handgun and bullets. Investigators said they later seized from the suspects two cars valued at a million baht. Police also brought to the news conference Thiprada Sanitchob, 40, who was charged with snatching the handbag of a Russian tourist at the Grand Hall Market. The bag contained 7,280 baht and an Apple iPhone 7 Plus.